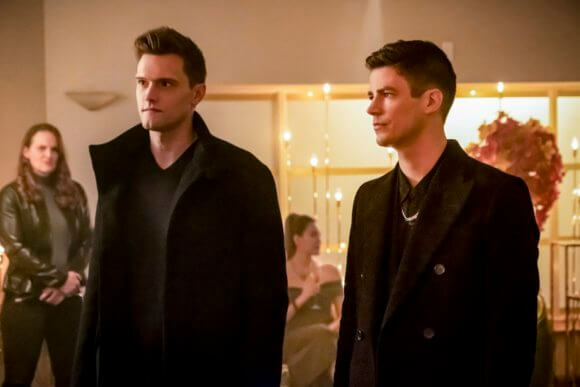 The Flash Season 5 Episode 13 Recap: "Goldfaced"
“Smile boys, tonight you’re working for Goldface,” says Goldface (Damion Poitier), an elusive arms dealer who’s just hired Ralph (Hartley Sawyer) and Barry (Grant Gustin). He believes the pair are criminals and snags them to help with a heist in season five episode 13 of The CW’s The Flash. As the episode titled “Goldfaced” begins, Sherloque (Tom Cavanagh) is still investigating Nora and trying to figure out who her accomplice is. What Sherloque doesn’t know is that Nora (Jessica Parker Kennedy) knows that Sherloque is on to her. Nora visits the future and asks Eobard Thawne (also Cavanagh), who’s still in a cell, what to do. Eobard reveals he knows after becoming a Wells what will distract this Wells…love. He offers suggestions on how to get him to fall for a specific woman. With his mind preoccupied, he’ll be too distracted to keep investigating her. At S.T.A.R. Labs, Caitlin (Danielle Panabaker) informs Ralph and Barry that she and Cisco have come up with a metahuman cure. The cure, once injected into a meta human, will take about a minute to shut down the part of the brain that gives metahumans their powers. Team Flash needs to find a way to immobilize Cicada long enough for the cure to work. Caitlin also has an idea of how they can do that. (Seriously, Team Flash would be completely lost without Caitlin and would never defeat any villains.) She tells Ralph and Barry a company created an anti-riot device called a field generator that should freeze any living thing within a confined radius. The devices, however, were stolen and Caitlin doesn’t know where to look for them. Ralph says he has a few contacts and should be able to find out. Ralph talks to his contact who confirms the arms dealer Goldface has the device. When Ralph tells Barry the speedster is not comfortable with buying a weapon from an arms dealer. Ralph reminds him the ends justify the means and that he was the one who said to think outside the box. 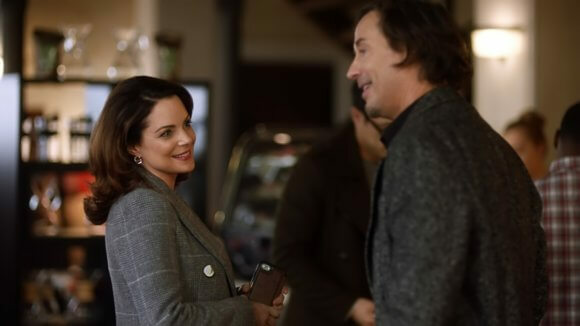 Nora takes Sherloque to Jitters and sets it up so that Sherloque will bump into the Earth-1 version of Renee Adler (Kimberly Williams-Paisley), the woman he has married several different times on multiple Earths. Sherloque is immediately smitten with her but when he shows off his detective skills to try and impress her, she gets freaked out thinking he’s a stalker. Ralph and Barry search for the black market and end up falling into the highly secretive illegal marketplace. One of Goldface’s goons quickly puts power-reducing cuffs on them and Ralph does some convincing talking about looking for a serious weapon. Ralph instructs Barry to just stay put and wait for him because he doesn’t know how to act like a villain. While Barry’s just standing there he’s approached by a guy who offers him a super cop-killing assault rifle. Barry tries it out and realizes it’ll blow through the armored vests police use. Not wanting the weapons on the street, Barry offers to buy all of them. The seller, sensing something’s off about Barry, signals Goldface’s goons. Ralph comes back and pulls Barry aside, reminding him not to blow their cover. “That was you?” asks Goldface. “Not according to police reports because the only evidence I leave behind are red herrings for idiot cops to chase down. You want to know who I am? You can call me The Chemist,” answers Barry impressing Goldface, his thugs, and even Ralph. Goldface motions for his gunman to relax and tells Ralph and Barry he has s a job for them, explaining he needs someone like The Chemist along to cover their tracks. Goldface and his crew are going to steal a 3D printer that prints organs from the lab before it reaches the hospital. Meanwhile, Iris meets a man who knew Orlin Dwyer and she gets a lead on where he lives. Iris tracks down the house and sneaks in to look for information. She hears the door and hides as Dwyer (a.k.a. Cicada) enters. Back at S.T.A.R. Labs, Nora tells Sherloque she has contacted some of his ex-wives to help. Sherloque’s not happy because his ex-wives didn’t know where to find him and he owes them money. In a very cute twist, multiple versions of Renee Adler appear as holograms to not help Sherloque but berate and chastise him. They end the conversation by telling him if he doesn’t pay them the alimony he owes with interest, they’ll send the Breacher after him. Before disappearing, one of his ex’s explains to Sherloque that he’s just not meant for relationships. Hurt and depressed, Sherloque walks off and Nora feels terrible. Ralph and Barry prepare for the heist and Ralph can tell Barry doesn’t want to go through with it. Ralph starts to try to talk to him about it, but Barry says he blew it. They could have just done a deal, but he had to overplay his hand and prove to be a villain. Barry believes Ralph is right and that he needs to be ready to get his hands dirty. Ralph puts Barry’s rifle in the dumpster and heads into the building while Barry yells to let him out. Inside the van, Barry starts looking around for something to use to break out of the van. Iris tries to slip out but is seen by Cicada just as she’s about to leave through the front door. She acts as though she’s coming in and lies to Dwyer, saying the door was open. Iris explains she’s a reporter doing a story on lead in the water in some of the houses in the neighborhood and wants to interview him. A suspicious Dwyer (for some unknown reason) agrees. At S.T.A.R. Labs, Nora apologizes to Sherloque. She believes he’s a romantic and that he can’t deduce love but needs to live in the moment of it. Ralph finds the 3D printer of organs in the lab but when he sees that it’s children who’ll be receiving the organs, he can’t go through with the heist. He knocks out one thug but a few more catch him and two take him down to the van to kill him. As they exit the building into the garage, Barry, who’s freed himself from the van, knocks out both the goons. Barry’s happy Ralph couldn’t go through with it either and together they grab their assault weapons, set them on stun, and get ready to take out Goldface’s thugs. In an exciting but bit overly long shoot out, Barry and Ralph prove to be expert shots against the thugs. They knock every single one of them out while never getting so much as even grazed by a bullet. Goldface shows up and orders them down to the van by activating their power cuffs to explode mode. Barry and Ralph face off with Goldface and he decides he’s going to kill them. Ralph and Barry fight Goldface and at first he’s getting the better of them. However, Barry uses Goldface’s gold whip against him and lures him into hitting an electrical box which electrocutes the criminal. Barry checks to see if he’s alive and, to even Barry’s surprise, Goldface has a weak pulse. Back at S.T.A.R. Labs, Caitlin checks over Barry and Ralph and deems both okay. Ralph’s upset they lost the chance to get the tech to stop Dwyer, but Barry reminds him that today was a win because they stopped a dangerous arms dealer and they did it without their powers. They need to remember that even when Cicada dampens their powers they have other ways to fight. Barry’s pep talk is interrupted by a call from Iris. The next scene shows The Flash speeding around Dwyer’s apartment and Elongated Man and Killer Frost breaching in. “Dwyer’s gone,” says Barry. Killer Frost and Elongated Man check all over but don’t find any evidence or clues indicating where Dwyer went. Iris asks if they got the device and Barry shakes his head no. Iris reveals they may not need it and tells the gang she knows how to give the cure to Cicada. Meanwhile over at Jitters, Sherloque explains to Renee Adler that he’s a master detective and just deduced what he got right about her. She demands he prove it by deducing a customer. Fortunately, Sherloque does so successfully. Smiling, Renee says he can call her sometime. Sherloque returns to S.T.A.R. Labs, closes the Nora file and opens up Cicada’s file. Nora, spying on Sherloque, smiles in relief. In the last scene of season five episode 13, we see a flashback of Eobard Thawne telling Nora that if her mission was successful, her secret is safe and they are free to continue what they started. Action-packed and suspenseful, episode 13 titled “Goldenfaced” gets the show back on track. And, better still, finally puts Iris back in the role she should be…helping by being an investigative reporter. The stand-out performances must go to Grant Gustin and Hartley Sawyer as Barry and Ralph trying to pose as criminals to get the tech Team Flash needs to stop Cicada. It’s the fantastic chemistry these two have that makes every scene with them sizzle with energy. The scene in which8 Barry comes up with his alter-ego character The Chemist is truly edgy and intense. Grant again shows just how versatile he is as an actor. Perhaps one of the best and most moving scenes is when Ralph locks Barry in the van. Ralph won’t let Barry cross that line of morals and ethics, and instead goes to cross it himself while Barry bangs on the door and shouts that he wants to have Ralph’s back. Each one is more concerned for the other than themselves. With Iris discovering Cicada’s weakness, it should be interesting and exciting to see Team Flash go up against Cicada. Let’s just hope their plan doesn’t backfire.